We make every effort to be a bright spot in the downtown where you can sit and relax, bring in a cup of coffee or even your dog on a leash. There are friendly, dedicated and highly knowledgeable staff and volunteers that are ready to help you find that particular book or to offer suggestions and who knows, you may even find a treasure! Well Read Books is Literacy Central's primary source of funding for our free literacy tutoring programs. The books are all donated by the community and through our partnership with the Rotary Club of Nanaimo Daybreak who have placed well marked book boxes around the community and work tirelessly to collect and deliver books to the store every week. 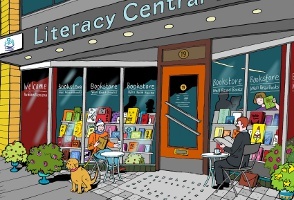 Help support our literacy programs by donating your books to our bookstore.